Sometimes I feel my blog doesn’t offer enough help to people who are just starting or struggling to find their grooves. Well, if you fit one of those categories, this one’s for you! In this podcast, I start with a very personal story and explain how hair loss and damage led me to the right topic. It also taught me a lot about what to focus on during the early days of your website. I will also offer help to those who are feeling overwhelmed with how to start, what you should ignore, etc. And if you haven’t had success with your site, I believe parts of this podcast will resonate with you. You may discover where you went wrong and get ideas for what you can do differently going forward. The great thing about the Web is that there really are no rules. You can have success with a variety of different approaches. BUT I still believe that much of success begins with HOW you start. And I want to make sure you are off on the right foot. Thanks for sharing, Lisa! I know you are keeping this simple for beginners, but I think it’s also important to make sure that the social media people choose to use is one that their audience also uses – not just what they personally love to use. Wow, fantastic advice. Thank you Lisa for this guide. Actually I am concentrating on finance niche, I am wondering if what will happen to my site if I will write other topics. “off topics” aside from finances. Now I know the advantage of having a niche blog. I can sympathize with the hair issue although I haven’t had your same issue of course but let’s just say I’ve never had great hair. I wish I could have worn wigs growing up. I would hate to be starting fresh today. My heart goes out to them because it’s a dog eat dog world out there and everyone has an opinion of course. I think people need to be taken by the hand and shown the way. I wish I had been told what you shared here in your podcast when I started. I was so all over the place it’s embarrassing to go back and look at what I did. I also had to learn as I went and boy did I mess up a lot. I would spend an entire weekend fixing things on my blog I didn’t know I was suppose to be doing. We all need someone with your heart to help us along the way. People want to know you care and those are the ones that will follow you to the end of the earth! Okay, I’m being dramatic there but you know what I mean. Great advice and thanks for sharing this with us. Wanted to stop by and check out what you were sharing this week. Hope you’re having a good one too. I think learning as you go and making those missteps is just part of the process. Most of us flounder around… I know I did my share! lol Thanks so much for the compliment. I do hope this podcast helps those who are just starting because I wish I had someone to tell me some of those things. Have a FAB day! Lisa I just stumbled upon your site and podcast and all I can say is THANK YOU!!!!! So much revealed in episode 5 that is helpful for a new blogger (like myself). I’ll take your advice and not try to be “the best” on all my social media pages. It is tiring and frustrating to say the least. ps – I too am a natural head, have been for years, so I get how hard your struggle must have been. Your hair looks great!! Thanks for sharing great information. I like this podcast and I really enjoy this. As always Lisa, this is awesome. I always learned something new when I visit your blog, thank you. Your podcast is deep, sincere, profound, and yet very instructive as it [did in fact] resonate with me. “Topic Focus” is extremely important in writing because [I believe] it’s intended to reach the audience in need of that particular “need-to-know” information or knowledge – the content within the body of the writing. necessary to succeed in building a successful, but profitable website/Web business. And for those that are looking to make money online should take heed to your advise – I know that I am. I’ve also struggled [in the beginning] with whether or not the topics I’m most fond of on my site would reflect enough emphasis on what I felt I needed to share with others who was just getting started out in business and on the Internet. Now that I’ve listened to your “podcast” I am confident that I have found the right angle and approach in expressing my online journey seeking prosperity through an Internet-based business. Lisa … Thank you for your constructive guidance, and may The Heavens continue to shine its love down upon you! Although the work is not quite complete on my sites, I know that when I am done with all the hard work going into creating my sites … ching ching! $$$ will be coming my way! Thank you sooooooooooo much, Kevin for your kind words. Good luck on your site!! For being here for us all! It is my first visit and boy I found a gem 😀 Lisa, thanks for the podcast. Awesome! I love it when I can inspire that Ah-ha moment! 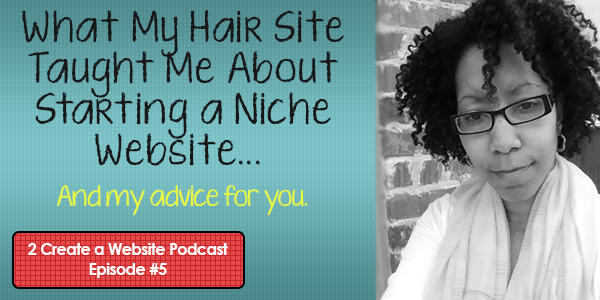 For years I’ve been emphasizing how you need to niche down. Well that isn’t always the necessity when you have a unique angle! Good luck to you. Keep me posted on how your site goes. There’s a Table of Contents on the NWS homepage you can browse through to get an idea of the topics covered, but it really focuses on keyword research, understanding how search engines work, affiliate marketing, tips for organizing your content and more. It’s really best for people who are JUST getting started. Thanks for getting my WP Guide! How do you know if Google has ranked your site. Install Google Analytics to discover what keywords your site is getting found for. Great podcast Lisa with helpful information as always. Thank you for sharing! Again, I really enjoy listening to your podcasts Lisa. Your hair looks great, by the way! stopthethyroidmadness.com will really help with your thyroid problems.. Thanks Alex but I had a half my thyroid removed in 2010 and was able to solve it that way and do not have to take meds. I had a goiter on my neck (enlarged thyroid). That, along with diet and exercise worked for me. I could probably sit and listen to you talk all day long! You really do know how to connect with your audience and I knew that from the very first time I watched one of your YouTube videos. Nice to hear you give my buddy Wade Harman a shout out. I actually think I missed that interview with Jay Baer. It came up in a conversation I had with Wade when I was interviewed on his other show – Blogging Warfare but I was too embarrassed to tell him I that I missed it. One of my blogging friends emailed me yesterday and asked if she could interview me. She was debating if she should do a written interview, a video or audio – or should she do all three! I really didn’t know how to respond but after listening to your show I feel better about my approach. Awwwww Ileane, you are so sweet and encouraging. That comment made my day so thank you!! Good luck with your interview. I’ll be looking for it on social media. I know you’ll knock it out of the park as usual. I agree! I feel like we are in the livingroom and you’re talking to me. That just shows that we have to be ourselves with our businesses. I prefer to focus on one social network, you get better results and if you’re not careful, social media become overwhelming. It can be. That’s why I always suggest starting slow and picking ones that are relevant and start with one. Two at the most. @Isaac guerrero focusing on so much on social media could divert you to another way and will mess your mind within it, and you’ll start feeling confuse about your aim and dream. and you will never get to know how to get so much from your professional. SO , its better to focus on your work do it very well get epertise in that, in the work which help people, entertain people and it’ll automatically start make people to connect to you and they’ll love to talk to you because of your work. and this how this will make it much more simple for you manage your social profile and will increase the speed of connecting new people. and yes! @Lisa Irby its really important to note how you start? and stick to it.